So much has happened in the past month! First and foremost, my big ol' chunky baby weighed in at 24 lbs. 5 oz. at her 1 year well-baby visit. That is the 94th percentile. 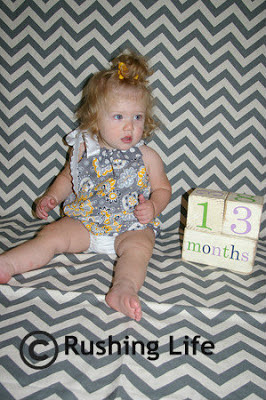 And she was 31 inches tall (although for as much as she was wiggling, who knows) which is the 95th percentile! She has always held firm with being a bigger baby and she didn't disappoint. Doc Hottie said she looks good and we should start giving her a vitamin. He didn't seem concerned about her eating (obviously) and thinks she's as adorable as ever. Mommy agrees. She started her new class at school, where she can't take a bottle AND she has to feed herself snacks & lunch. I've been at a loss for what to send, but turkey & ham Lunchables have been a God-send. She has also successfully taken to eating hummus on toast, cheesy rice, and even some pasta on rare occasions. Oh yeah, and peanut butter! Still working on the veggies. She puts them in her mouth, but then spits them out. Transitioning from formula to milk was super easy! I actually drug it out longer than necessary for selfish reasons... I had formula left and I underestimated the amount of milk she would drink. If I gave her all the milk, I wouldn't have any for my cereal! I suppose our next hurdle is going to be for her to start using some utensils. I have a feeling my OCD is not going to do well with this training process. Bimmer is also doing all these cute things these days. She is perfecting her princess wave. She loves to wave at everyone and anyone. Sometimes it's the TV, or a passing car, or a person 50 yards away. She mimics me a lot more now playing peek-a-boo. Although sometimes she ends up with her hands on the top of her head or over her ears. I've caught her moving things around in the house now too. She likes to take all my shirts out of a drawer that is at her level, and put books in the drawer instead. Sometimes, I can even point at my cheek and she leans in to give me a kiss. One not-so-cute thing is that if we tell her "no" she shouts back at us. It even sorta sounds like she is saying "yeah." And if we do slap her hand away from something, she reaches to slap us back. Yup... we have our hands full with this one! But on the flip side, she's been giving really good hugs lately! She knows what it means when I say "kiss" and when I ask her where her nose is, she points to mine. I feel like she's soaking up something new every day! She still only really says "Mama" and "Dada" but not even always appropriately. She knows who we are, but never necessarily calls for us. We've been working lately on a few other words. Or well, I guess you can call them "words." When she does something and wants our attention afterwards, she says "Ta Da!" And we've been trying to get her to signal for a TD and say "touchdown." She usually puts her hands straight out, instead of straight up, but she does mumble a word that's in the vicinity of "touchdown." My favorite though is when she drops something, she says "Uh oh." Except it never sounds like "uh oh." Either it sounds like "oh oh" or it sounds like "uh ewwww" which she drags out. I swear it's the cutest thing ever. And I may make her drop things on purpose so I can hear her say it. Poor kid. Oh yeah - and that minor detail - she's WALKING! After being in her toddler class at school for one week, they were saying she was getting super frustrated that she wasn't actually moving forward. They said she kept standing there leaning forward, grunting and trying to get somewhere. So I made it a Mommy Mission that weekend to get her walking on her own. When Puff and I could be there to see it. I would make her walk everywhere holding just one finger, and sure enough, by Saturday afternoon, she took a few steps by herself. And as we cheered and showered her with hugs and kisses, she would take even more. She finally decided to walk from the living room to the kitchen and I almost cried! She was so proud of herself. And I was proud of her too... even if she would fall forward after a few steps, she wouldn't give up and crawl. Nope... she kept at it. That Monday, her daily report from school said "She was walking everywhere!" It's amazing how much has happened in just over a year. I feel like the walking is her last major physical milestone. Now we get to look forward to hearing her talk. As much as she jabbers, I know that can't be too far behind. I'm anxious to hear what she has to say! 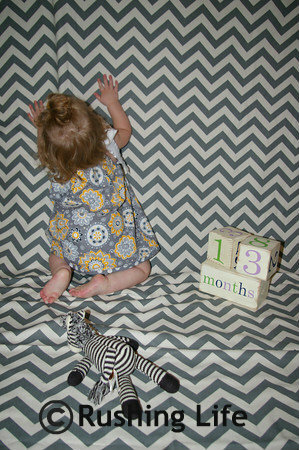 Trying to keep a super busy toddler standing/sitting still for any length of time on a homemade backdrop is near impossible!